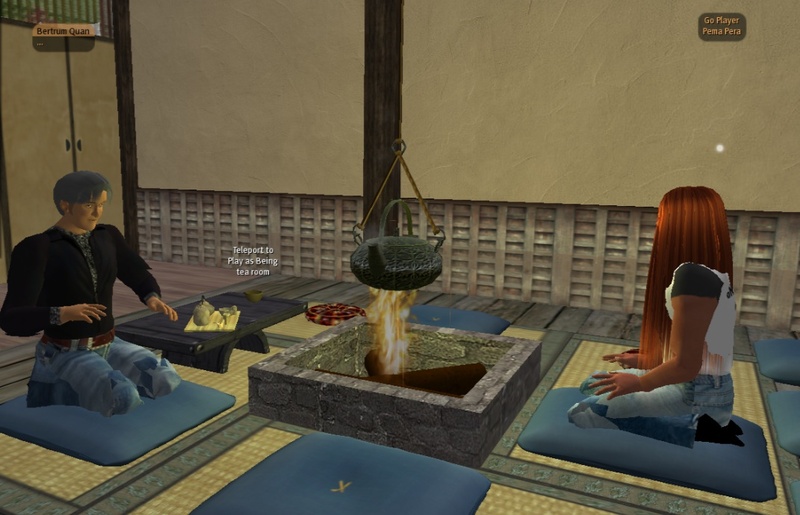 That night I got in-world early, half an hour before the 1 am SLT time for the first session of the day. I noticed that Storm was online as well. It was 8:30 am for him in Scotland. I saw him standing near our new place, and walked up to him. Under his able hands, the land trembled and moved and a moat appeared around Dakini’s new building while I was watching. Pema Pera: Wow, landscaping while I watch!! Storm Nordwind: Sure. Very quick before i go to work! Pema Pera: How to indicate people at the tea house to go here? Pema Pera: give them a tp? Pema Pera: is that easy for you to set up? Pema Pera: And as for a lm — can I use these coordinates here, for a slurl from outside, or is there only one entry point allowed per lot? Pema Pera: yes, that would be great! For a while I just watched, enjoying Storm digging and moving the soil. After a while, water appeared and started to flow through the new moat. Storm stepped back, looked at it, and seemed to be as pleased as I was with the result. Pema Pera: Looking nice and watery! 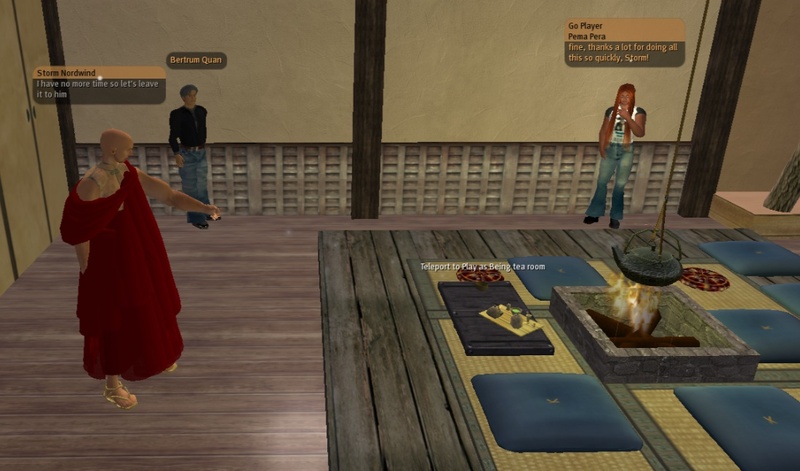 Pema Pera: So what slurl shall we use here? Storm Nordwind: What do you say about dividing off this square plus the tea house? Pema Pera: can you give coordinates? Pema Pera: yes please, thanks! Pema Pera: what shall we put up on the sign? Pema Pera: “for the new Play as Being meeting place, click here” ? Storm Nordwind: one thing at a time! Pema Pera: take your time! We then walked over to the tea house, where Bertrum was waiting inside. Storm quickly put up a nice and natural looking stone, to the South end of the row of stone benches, as a teleporting device. Pema Pera: so clicking on the rock? I tried first a left click, and next thing I knew is that I tumbled out of the sky near the moat. I walked back, tried the sit-on-it option and yes, that worked too. Again I walked back, and this time I entered the tea house to greet Bertrum, who was still inside, and so was Storm. Pema Pera: a small sign on the wall perhaps? Pema Pera: or at the central fire? Pema Pera: Bertrum, we are in the process of moving to a new place. Pema Pera: great idea Storm! Bertrum Quan: a singing bowl? Storm Nordwind: No sound though - it would disrupt! Pema Pera: as for a sign, would you like to leave that to Moon, or is it easy to do it right here, with his latest logo from the pab google group web site? Pema Pera: fine, thanks a lot for doing all this so quickly, Storm! Both Bertrum and I had been watching the speed with which Storm first created a tea cup, starting with what seemed like jus a block of wood, and then changing it into a tp device. Storm disappeared, and returned a few moments later. Pema Pera: ah, you tp’ed yourself? Storm Nordwind: He tried it too! Storm Nordwind: A final check and I will take my bath and go to work! I touched the bowl as well, and wound up once again at the new place, where I was greeted by Bertrum. Bertrum Quan: pera, when will the others arrive? Pema Pera: but please make yourself comfortable! Bertrum Quan: oh. is Storm in the US? Bertrum Quan: US and I am awake (but perhaps not in a Buddhist sense,,,). Pema Pera: You’ve been here a few times now, yes? Pema Pera: Did you get a chance to play with the 9-sec explorations? Pema Pera: would you like to take a seat? Given the quiet time, it occurred to me that this was as good a time as any for Bertrum to give the 9-sec exploration a try. Pema Pera: if you like, you can do it right now: just drop whatever was on your mind, take a good breath, and wait for something like 9 seonds — doesn’t have to be precise. Bertrum Quan: truth is the computer is a distraction… but there is a sense of anticipation. Pema Pera: How did it feel to take the breath? Bertrum Quan: how do you feel when you do the experiment? At that moment my internet connection stopped working. It took me a while to get it up and running again, and then I had to re-login. Bertrum Quan: is it acceptable for me to ask you how you respond as well? Pema Pera: so in that sense, when I tell what happens, I am reporting not only on PaB, Play as Being, as such, but of course my whole life experience is folded in there — as must be the case for everybody of course. Commenting this part now, I’m smiling at the thought of Dakini smiling, reading this, seeing how somebody had succeeded in letting me talk. Quite a while ago, she had noticed that I rarely talk about my own experiences. Truth is, however, that I am rarely asked these questions, and whenever I am asked, I do talk :-). Pema Pera: seem very very long . . . . I didn’t want to monopolize the conversation, though. Bertrum Quan: that’s extraordinary… you enter a timeless state of being… when time in this case expands…. Pema Pera: entering is not quite what happened — more a recognition that that is the only reality, and a realization that the illusion of time was just that . . . .
Pema Pera: an illiusion . . . .
Pema Pera: and from that “place” that is no place you can watch all the comings and goings, like a movie, like a dream, and really enjoy and taste them, without becoing caught up in them, respecting and appreciating without buying into. Pema Pera: and holding those three, in a way — but words are trickly . . . .
Pema Pera: inherent in the whole way we deal with ourselves, each other, the world — and yes, language codifies that, and is part of the tight mesh that (seems to) keep(s) us trapped — but we are never trapped. Bertrum Quan: I have not. Bertrum Quan: what was useful to you early on? Pema Pera: well, those are hard questions to answer, mostly because they are wrongly posed . . . .
Pema Pera: it really is essential to see this . . . and there is no way to prepare for seeing, for Being . . . So that was the correct answer, but it seemed only fair to odd an incorrect answer, on the relative level at which we normally talk . . . .
Pema Pera: PaB is the shortest shortcut I’ve found so far . . .
Pema Pera: and remember, that way of speaking is fundamentally flawed. Pema Pera: she likes them and what is more, actually really works with them! Pema Pera: what did you make of it? Bertrum Quan: I didn’t see the Adams material on the blog… where is it exactly? I invited Bertrum for a second (very brief) round. Pema Pera: would you like to do another 9 seconds exploration right now? Bertrum Quan: a question first: do you feel the practice is necessary to prepare one to see through the illusion of duality? Pema Pera: by someone following the tradition of Nisargadatta — no practice, just reminders of that IS. Pema Pera: but various forms of practice can help, yes. Pema Pera: and he addresses points you just mentioned. Bertrum Quan: are there links from your blog? Before wrapping up, I wanted to make sure, as much as I could, that I did not give any wrong impressions. Pema Pera: 3) I’ve given a very very toned-down version, not even PG :). To be more honest in my descriptions, I would have had to throw in all kinds of much more weird and wild seeming stuff as well, but that then would require me to say even for more, and I’ve talked a lot already. At least I think I’ve given some of the essence. Pema Pera: … words are only faint whispers here . .. .
Pema Pera: would you like to try another 9 seconds? We paused a while, and Bertrum tried out the 9-sec exploration. Bertrum Quan: my response is whole– feeling contradictory feelings at the same time: movement and lack of movement, breath and lack of breath, sounds of like and silence. Pema Pera: glad to hear that, Bertrum! — isn’t it nice to just allow yourself to explore? Pema Pera: well, thanks for coming over! Bertrum Quan: thank you for your conversation. Pema Pera: thank you too! Bertrum Quan: will future meetings be somewhere else—the teleporter? Pema Pera: be well, and c u ! Bertrum Quan: yes, thank you.